ISLAMABAD, Pakistan (CNN) -- The Pakistani military said Wednesday it hopes to clear Taliban militants from Mingora, a major Swat Valley city, in the next two to three days. 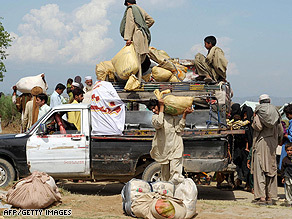 The fighting in the Swat Valley region has forced thousands of civilians to abandon their homes. "Security forces have made considerable progress in Mingora town," the military said in its daily war roundup, making reference to the largest city in the Swat Valley. "House to house search is in progress in most of the areas." The military said Saturday its push to clear militants from Mingora is the "most important phase" of its offensive against the Taliban. It has pledged to remove Taliban militants from areas in the North West Frontier Province -- vast swathes of the which have been controlled by militants imposing their own fundamentalist interpretation of Islamic law. The military Wednesday afternoon said 12 "miscreants-terrorists" had been killed in various areas of Swat over the last 24 hours in exchanges of fire with security forces. It said one soldier was killed and three others were wounded. The military said the return of internally displaced people would "depend upon restoration of electricity, water and other services". The scale and speed of this month's population flight is said to be the worst since the Rwandan genocide in 1994, the U.N. refugee agency said. The central government has long exerted little control in the area, but it launched a military offensive in late July to flush out militants from areas of the North West Frontier Province. As retaliation for the military presence, the Taliban carried out a series of deadly attacks, beheadings and destruction of girls' schools. Earlier this year, the government struck a peace deal with the Taliban. As part of the pact, the Taliban was allowed to impose sharia, or Islamic law, in the valley. Under the Taliban's strict interpretation, the law prevents women from being seen in public without their husbands or fathers. But the deal soon fell apart, after the militants took control of the neighboring Buner district. The invasion of Buner brought the Taliban closer to the capital, Islamabad, than it had been since it mounted its insurgency. The capital of the nuclear-armed nation is just 60 miles (96 km) from Buner. The militants' move into Buner prompted the military's latest offensive. On Friday, the army said it had broken the back of the Taliban in the Swat Valley.